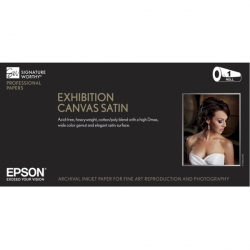 Exhibition Canvas Satin is an acid-free, lignin-free, heavyweight cotton-poly blend. Whether the application is photographic portraiture or fine art reproduction, Epson Canvas will satisfy even the most demanding professional by providing both the finest image quality as well as a vehicle for enhanced artistic creativity. Made from the highest quality 100% cotton duck fabric, this unique heavyweight, quality canvas utilizes a tight weave that is ideal for photographic and fine art reproductions. With a high resolution coating that is pliable enough to withstand stretching, Epson Canvas displays a subtle texture for a true artistic look and feel. Combined with incredible color reproduction, a medium gloss finish, and an acid free archival quality base, this canvas is versatile enough for all applications that require the highest image quality and an archival display life.